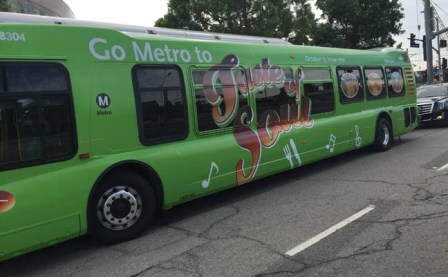 The Los Angeles County Metropolitan Transportation Authority (Metro) is encouraging the public to Go Metro to the 11th annual Taste of Soul on Saturday, October 15, from 10 a.m. to 7 p.m. The festival will take place on Crenshaw Boulevard between Rodeo Road and Stocker Street, in the heart of the historic Crenshaw District. To avoid the hassle of driving and parking, festival-goers can take Metro Expo Line to the Expo/Crenshaw Station, which is a short walk from the festival. Free parking is available at the following Expo Line stations: Expo/Crenshaw (220 spaces), La Cienega/Jefferson (476 spaces) and Culver City (586 spaces). Parking for a $2 fee is available at Expo/Sepulveda (260 spaces), Expo/Bundy (217 spaces) and 17th St/SMC (67 spaces). For more information on parking and parking fees visit metro.net/parking. Metro is building the $2.058-billion Crenshaw/LAX Transit Project that will connect the Crenshaw, Inglewood, Westchester and LAX communities along the 8.5-mile alignment with eight new stations; Crenshaw/Expo, Martin Luther King Jr., Leimert Park, Hyde Park, Fairview Heights, Downtown Inglewood, Westchester/Veterans, and Aviation/Century. A ninth station at Aviation Boulevard and 96th Street will allow transfers to a future automated people mover to be built by LAX that will connect to the airport’s terminals. Metro and Walsh/Shea Corridor Constructors (WSCC) will have a booth at Taste of Soul on Crenshaw Boulevard between Rodeo Place and Coliseum Street. The booth will have information about the Crenshaw Line and other Metro projects and programs. The mobile Metro Experience Theatre will be showing rail safety videos along with safety presentations by Metro staff every 20 minutes. Metro will hold a drawing for three large prizes. Metro staff will also be on hand to respond to questions regarding Metro Art, walking and biking projects, the Express Lanes on the 10 and 110 freeways, TAP cards and fares. Educational information on Measure M will also be available for the public. Metro Bus lines that will be detoured during the Taste of Soul Festival included: the 40, 102, 105, 210, 710, and 740. Signs in English and Spanish will be posted at bus stop regarding the temporary route changes or check Metro’s Service Advisories at metro.net. For more information on Crenshaw/LAX Transit Project go to metro.net/Crenshaw or join us on Facebook at facebook.com/ crenshawrail and on Twitter at twitter.com/crenshawrail or call the project hotline at (213) 922-2736.